I've talked about my jump from kindergarten to 3rd/4th before. Obviously, it was a little traumatizing. ;) In many ways, it was like being a first year teacher all over again. I had to rethink and retry many of my management and organization tricks. I won't pretend to be an expert on anything, but there were definitely some things that I learned, that I think could be so helpful for others! Before I fully explain this, I'm going to give you a little back story (you can skip on down to the picture if you want to avoid my real life breakdown). I had gone from a self-contained kindergarten classroom to a 3rd/4th grade blend that rotated for nearly every subject. I had a 3rd/4th Grade Homeroom, 3rd Grade Reading, 4th Grade Math, 3-5 Reading RTI and a 3-5 Math RTI every day. 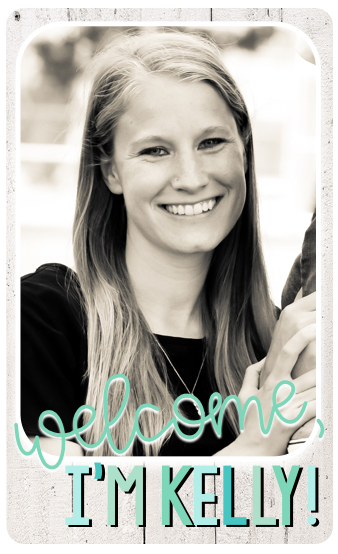 To say it was an overwhelming change would be an understatement, but I had the most supportive and patient teammates and administrators while I tried to work out the kinks. 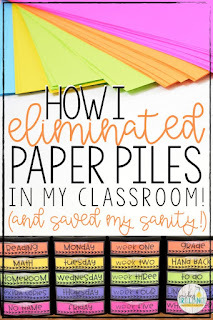 Probably the hardest part for me was keeping up with the paper piles. 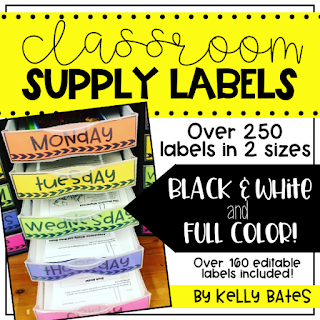 I had 5 different classes to make copies for each day (with different quantities of kids in each group. Five different groups turning in assignments to the same turn in basket. I had copies everywhere, and could never seem to find what I needed when I needed it. I was a hot mess to say the least. Just before Thanksgiving, the stress of feeling like I was drowning in a sea of endless photocopies hit me so hard. I remember breaking down sobbing in front of a co-worker, who happened to have a student teacher with her, and then the principal walked in. 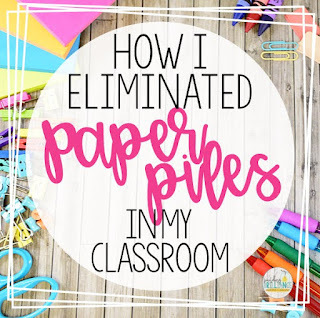 They were gracious, but I decided I needed to find a way to keep all of my papers organized so that I wasn't losing them, so that kids knew exactly where to find things, and so that I could access them easily when needed. So here's what I did...And it has worked beautifully! I found these awesome Sterilite slide drawer storage containers. They come in stacks of 3 drawers, but the thing that I loved most about them is that I could detach and re-stack the drawers to make them any height I wanted. (This is not true of all Sterilite drawers, so be sure you are buying the ones that can detach.). You can find the ones that I used HERE. I also printed the labels on Astrobright paper. I check my local office supply store, but Amazon usually has the best price. You can snag some by clicking HERE (affiliate links). My drawers are five high and four across. Each drawer has a specific purpose. On the left are my turn in drawers. 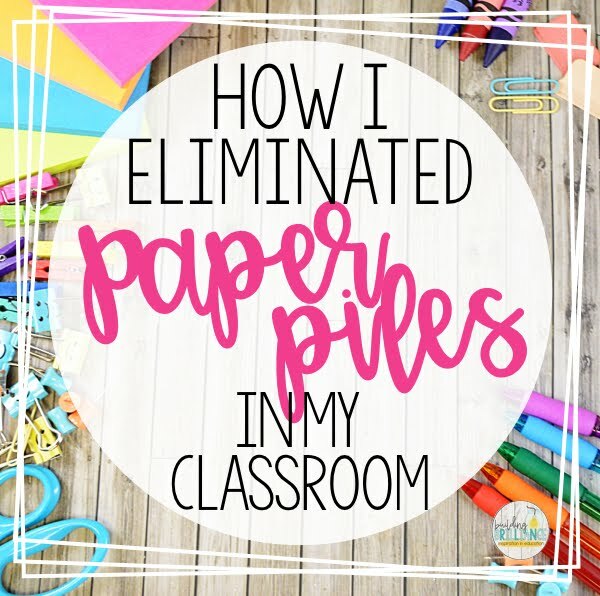 Since I teach different groups for each subject, it’s easier for me to manage the paper piles if they turn in their assignments separately. 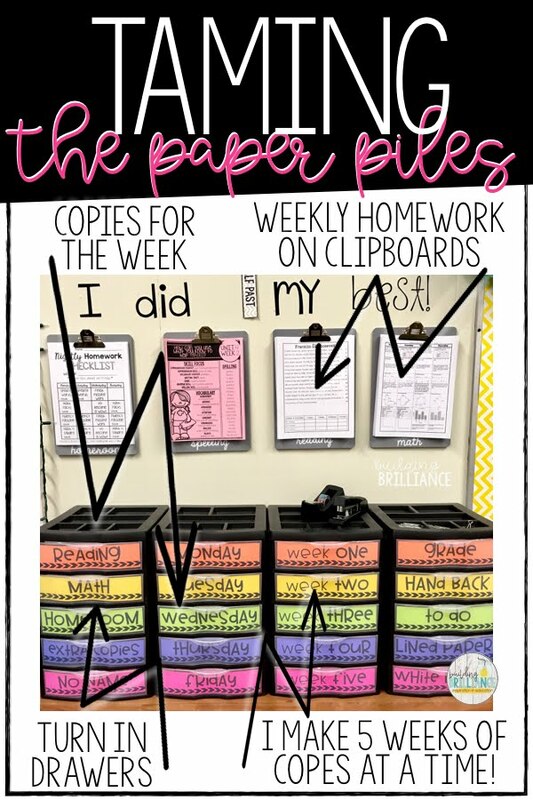 I always print a few extra copies and extra copies drawer is there for if students lose an assignment or are absent (these become scratch paper if not used). I send home missing assignment reports every Wednesday, so they always know what they need to find. The No Name speaks for itself. 😉 I also put any incomplete assignments there. I clear out all of these drawers at the end of the week to start fresh. In the Monday-Friday drawers, I keep my copies for the week. I also put my read alouds and our emergent readers for the week in these drawer so I don’t lose them. This makes it especially easy if I have a sub. All of my copies are already printed and in an easy to find place. I've actually had so many compliments from subs on this! I swear our printer hates me and WILL break if I wait until the last minute, so I make all of my Wonders reading copies 5 weeks at a time. 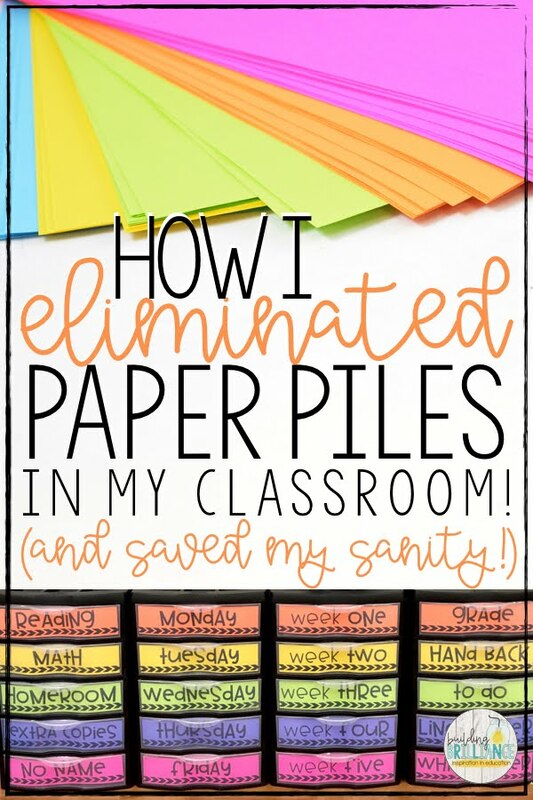 I also make my homework copies in 5 week chunks. Those get stored in the Weeks 1-5 drawers. On Fridays, I just pull them out and sort them in to the Monday-Friday drawers and I'm ready to go! On the right are the drawers that are mostly for my own benefit. The “grade” drawer is for things that I’ve pulled out of the turn in drawers that someone else can grade for me. A parent maybe (wishful thinking 😉). The Hand Back drawer is for things that have been graded and entered, and are ready to send back to the kids. I have student helpers who can pull from that drawer and put assignments in mailboxes. The “To-Do” drawer is where I hide things that I need to do, but don’t want to. 😉 Lined Paper and White Paper are there for students to grab whenever they need. The clipboards...This is where I keep my weekly homework. Each students has about 10-15 minutes of homework per night. They get this on Monday and it’s due on Friday. Most of my kids do it all on Monday and have nothing for the rest of the week. It's really up to them. If they lose it or are absent, they always know where to find an extra copy. One of the bonuses to this system is that it makes kids take accountability. It's really hard for me to lose an assignment, and they know exactly where to look if they're missing something. It gives them tremendous ownership and responsibility. And that, my friends, is a huge win! If you end up using these, or something similar, I'd love to hear about it! 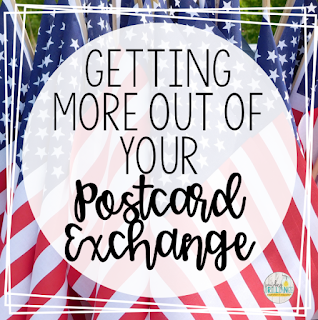 This system has legitimately saved my sanity, and I wish I would have done it sooner! 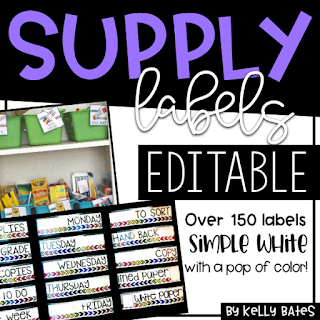 As always, if you loved this post, I'd appreciate you re-pinning for me! :) Thanks, friends!